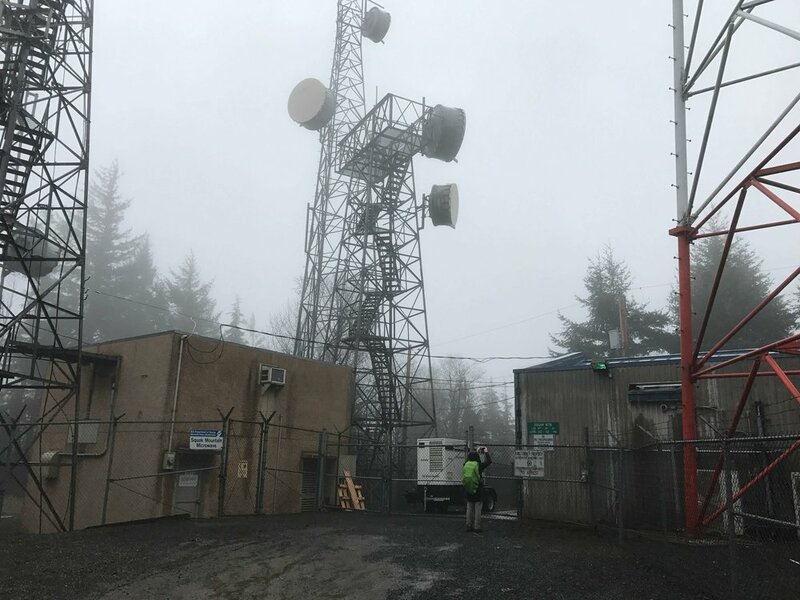 Situated between Cougar Mountain to its west and Tiger Mountain to its east, Squak Mountain is the 2nd most westerly mountain of the Issaquah Alps. The name Squak is said to come from the local Salish Native American tribe’s name for this place. The highest point, Central Peak, would be our destination on this wet, rainy day. As parks go, with the exception of the parking lot, vault toilets and a few picnic tables, this park is all forest. It was raining when we arrived, so we donned our rain gear, covered our packs and headed out. The trail signage is ample and clearly marked. A short stretch of trail leads to a gravelled logging road with the trail continuing into the forest on the other side. 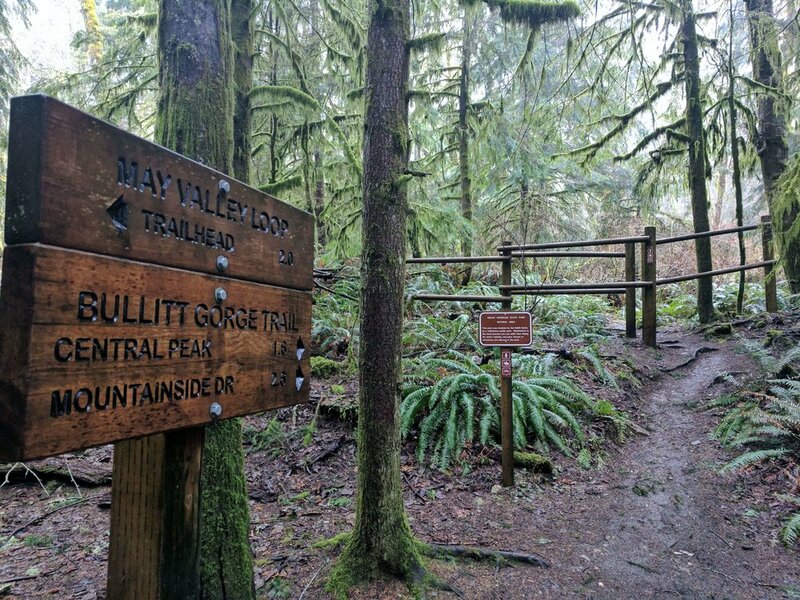 The flora is lush along the trail, ample with ferns and moss covered trees. 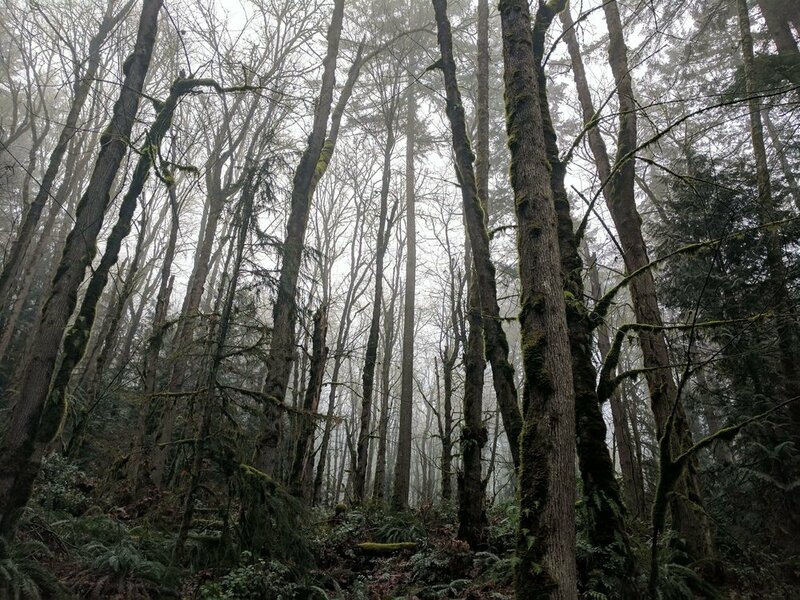 On this misty, rainy day a fog hangs in the trees that seems to squash all sounds aside from the gurgling of the numerous small creeks and the steady drip drop of rainfall. 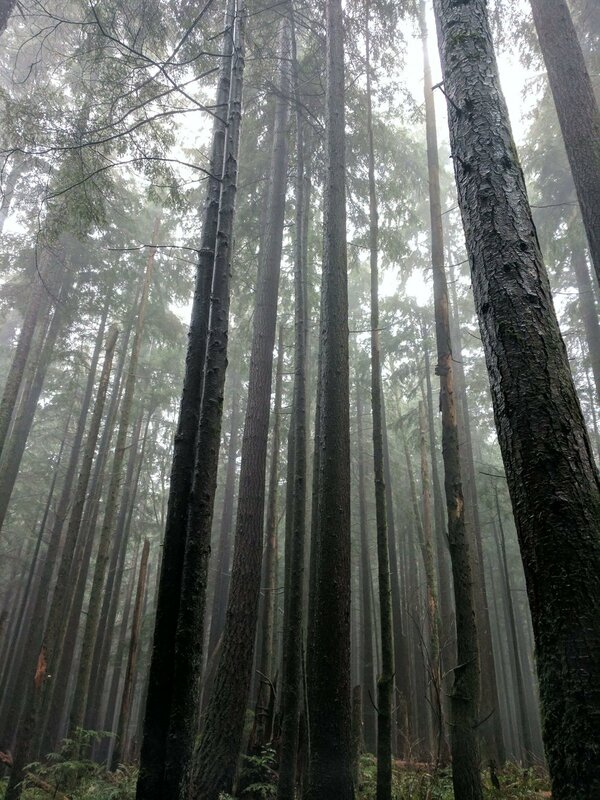 The history of the forest as being used for timber extraction is obvious at every turn. Large stumps of old growth trees are abundant. The evidence of a more recent fire is shown in a stand of limbless, charred remains of what are now just erect poles in the ground. 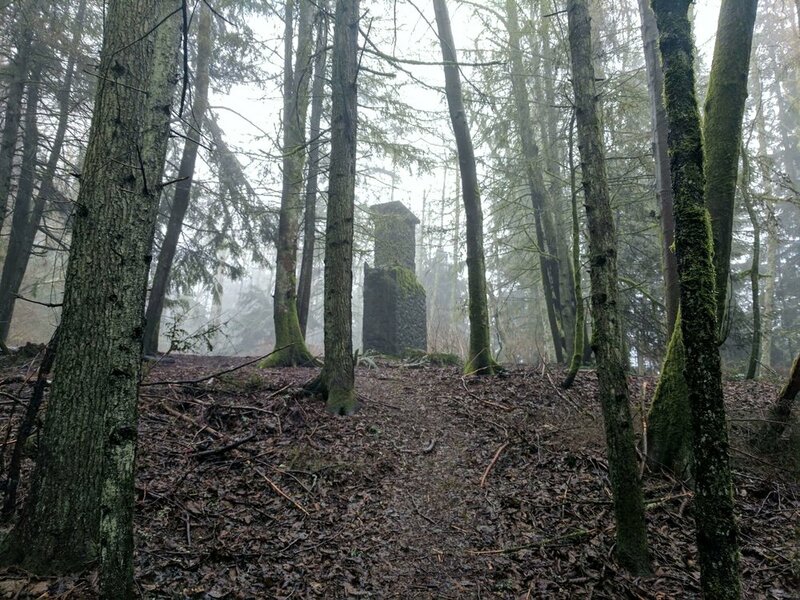 This spot had a particular eeriness to it with the low lying fog. The muddy trail sometimes doubled as a creek bed on this damp day, but only for short distances. The first 1.5 miles of the ascent was not particularly strenuous with the elevation gain pretty evenly spread out. That changed to a noticeably steeper challenge for the remainder of the trail to the top. While there were no scenic overlooks, no real views, the immediate surroundings were peaceful. Not being able to see for much of a distance added to a sense of mindfulness and appreciation of the moment. 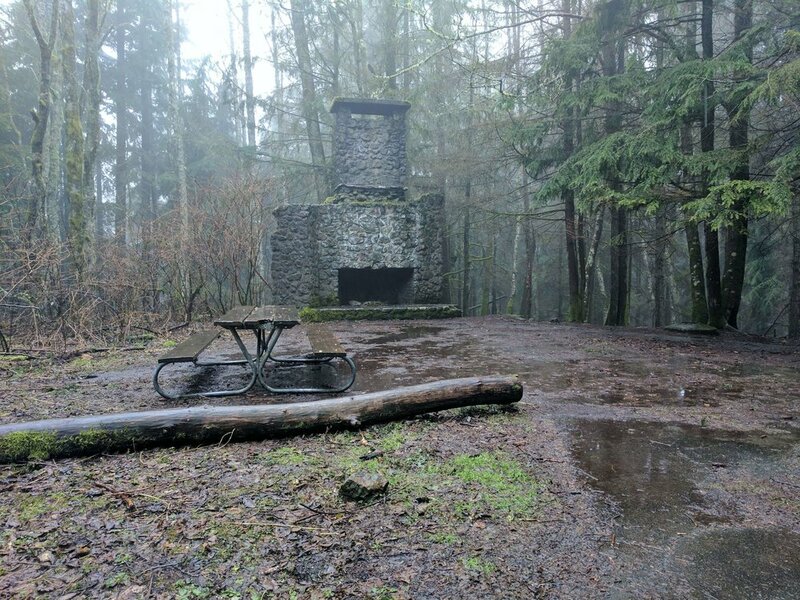 Soon we came upon the old fireplace and foundation of the Bullitt homestead. Interesting being so out of place in the middle of the forest, it gave us a reason to rest a moment before our last push to the top. On clear days, there should be views from this vantage point, but not today. The top is home to a microwave antennae station, surrounded with chainlink fencing. There was also a portable bathroom here, which was convenient. We decided to follow the logging road back, as there are a number of ways to make the trip. The pitted, gravel road was rutted with rivulets of water as the rains continued. 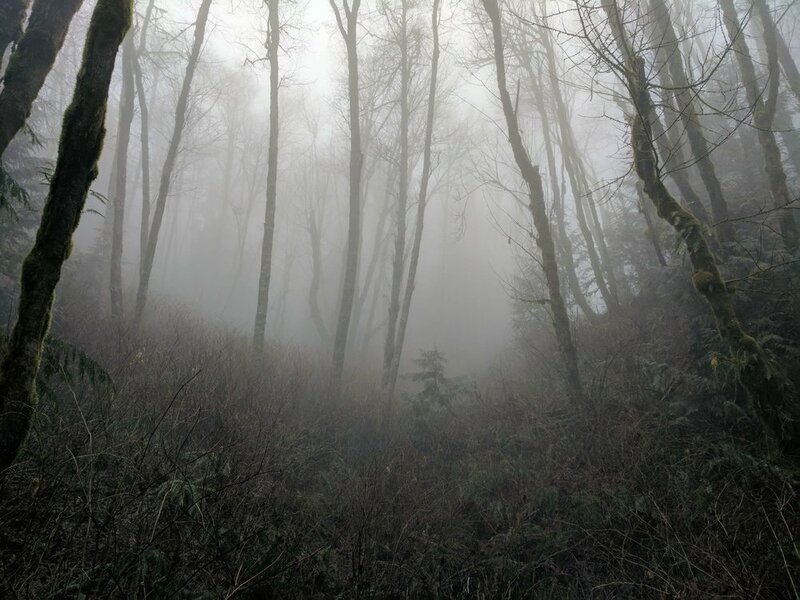 This route down was quite steep and a bit slippery, but provided some great photo opportunities of the fog shrouded forest. We put in near 7 miles of hiking by the time we returned to the Jeep and were muddy, damp and chilled. It was still a great outing. Fresh air, forest, and time spent in nature is never a poor use of time.